It’s tough to imagine experiencing a more palpable artistic realization of the essence of modernity than spending one day at Bang on a Can’s annual summer residence at Mass MoCA, in North Adams. By widening the lens through which we look at nature and culture, the ample energy of interacting ideas there created an electrical counterpoint that was vital. Founded in New York City 27 years ago by composers David Lang, Michael Gordon, and Julia Wolfe, Bang on a Can has created that rare thing: a musical consortium dedicated to promotion of challenging contemporary music which is backed by a substantial and dedicated following. Over the past seven years, Bang on a Can has found a perfect home-away-from in North Adams. The town is a prime example of revitalization: once vibrant, then broken, an industrial graveyard whose economic resurgence owes itself in large part to an unapologetic embrace of culture and creativity. That process might easily be extended to include revitalization of the tradition of so-called classical music, which is what makes BoaC’s residency a natural fit. Past easily mingles with present: ruined factories of worn brick and steel converted to artist lofts and, of course, Mass MoCA itself, one of the more fascinating and engaging places on the planet to take in contemporary art. Terry Riley’s In C is the perhaps most infamous consciousness-altering piece of music composed in the wake of the upending of tonality. 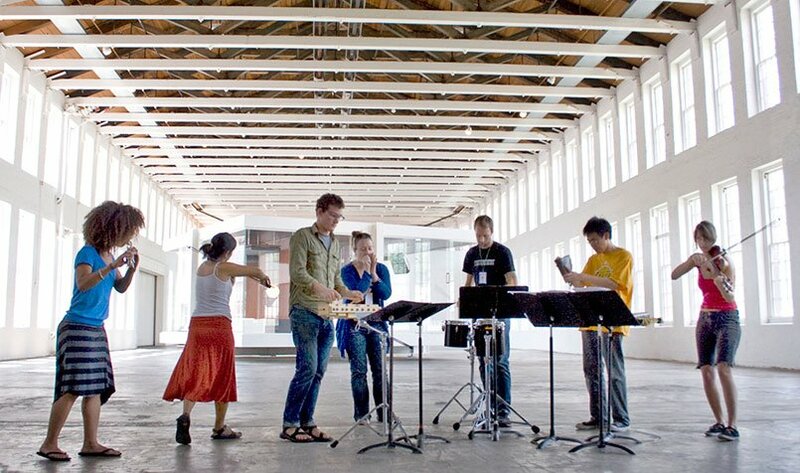 Composed in 1964, the piece became an ignition switch for the minimalism that followed, with the success of composers like Steve Reich and Philip Glass validating the notion that music born of simplicity, repetition, and an embrace of non-Western rhythmic techniques could reclaim art music from the ideological grip of the elitist academy. Performed by the young members of BoaC’s summer institute, In C felt entirely at home amidst the massive third-floor gallery, adorned at present with Israeli artist Izhar Patkin’s The Wandering Veil. The players seemed joyfully at ease with the music and with one another, bouncing about, exchanging winks and smiles as they wandered through Patkin’s rooms, adorned with billowing translucent curtains of pleated tulle. (Later, an impromptu performance of Reich’s Clapping Music performed by two young musicians—for an audience of three—broke out in the gallery; these young artists are utterly convinced of their mission.) Swashes of light pinks, reds and greens suggest characters and storylines: a lonely train station, the President and Mrs. Kennedy seated at a concert, Victorian funeral statuary, all of these settings themselves inspired by poems of the late Kashmiri-American Muslim poet Agha Shahid Ali. Any decent performance of this work, comprising 53 “sections” of riffs composed “in C,” should feel immersive. Riley provides only brief melodic patterns to the performers, who must decide when to move to their next series. Performing this piece in an art gallery encourages self-curation for audience members: Which room will I enter? Which ensemble will I follow? One is reminded of a similar self-direction in a theater piece like the unspeaking, audience-participation Macbeth riff Sleep No More. The artistic and commercial success of immersive art points not to a pandering ploy imagined by savvy marketers but rather to a paradigm shift in the way public art is packaged and presented. In such a setting, potential connections between sound and place reveal themselves abundantly. Contrast this with the uniform sonic texture available to a concert attendee in a traditional hall: although the ensemble itself will offer many gradations of sound, a listener fastened to his seat receives only the sonic experience available to that seat. I can’t imagine this Riley piece working anywhere near as well in a traditional concert hall setting. Curate your own experience; choose your own adventure. The evening concert featured music of Pulitzer Prize-winning composer David Lang, a composer who achieves that elusive quality characteristic of Arvo Pärt, or jazz performers like Miles Davis and John Coltrane: his sound is instantly recognizable. Pierced, an unconventional concerto for cello, piano, and vibraphone with orchestral accompaniment, employed jagged, angular lines, striving toward some unattainable, elusive rhythmic resolution. This music is Grade A – Difficult, and the players, led by the fastidious Bradley Lubman, without question one of the leading conductors of new music in America, played almost impossibly in synch. I set my eyes on the pianist, whose blistering syncopations were executed so precisely with the vibes that one could watch one instrument and hear the other. Once one settles into his torrid rhythmic landscape, one senses an inner logic to Lang’s scraps of melody, which feel, appropriately enough, like a historical extension of In C. (Lang’s harsh, off-kilter rhythms, however, indicate more the presence of Stravinsky and Bartók than Riley’s languid, almost aimless nuggets of melody.) There’s also a kinetic energy which draws from electronic music: Autechre, Aphex Twin, or Squarepusher, perhaps. Lang’s counterpoint duly reminds one of the industrial factories that pervade the Mass MoCA campus: the ghostly thrum of relentless churning, guts and sweat set in motion to produce rough, earned beauty. Lang’s sunray implemented his contrapuntal assuredness. The melodic lines have an elasticity that makes them seem almost infinite; there’s nary a sense of forward momentum or typical arc, and silences aren’t mere spaceholders but are imbued with urgency. Harmonically, there’s a sense of floating and flirting with the “sweet” notes that would provide resolution, yet Lang never lands on them squarely. He seems to find syncopations within syncopations, and one wants to be hip enough to truly feel this music the way the performers do. After the afternoon’s immersions, however, one desired almost a less static presentation of these sounds: perhaps a ballet dancer and a kickboxer might have burst from the stage wings to join the fray? Singer Shara Worden, making waves in the New York City indie scene with her band My Brightest Diamond, turned in a performance both ravishing and gripping of Lang’s Death Speaks. This fascinating, ecstatic song cycle culls texts from Schubert songs which mention “death” and personifies the character of Death in Worden, positioned center stage. Worden’s otherworldly voice, an angel from the afterlife, is reedy and affecting, employing tight vibrato and almost thrillingly accurate intonation. Stark and sent from another age, her graveswept alto feels like a singing embodiment of an ancient New England headstone proclaiming “Sacred to the memory of.” It is unlike anything you’ve heard, and it’s impossible to imagine another singer performing this work as convincingly. The evening concluded with a special solo by Worden in a smallish, impossibly hip brick room nestled by the gurgling river. (Was this Williamsburg Brooklyn and not western Massachusetts?) Worden managed to rig her laptop with thumping backup tracks in place of her live band, and any questions over authenticity were quickly supplanted by Worden’s rare vocal ability and presence as a songwriter. Highlights included a cover of Nina Simone’s “Feelin’ Good” and a raw blues; from hearing Worden on record, I wasn’t aware she had such musical range. The audience seemed to sense they had witnessed a young talent with her finger on the pulse of something truly new. The post-show hang continued long into the night, musicians and fans intermingling in a palpable sense of community, conversation, and excitement. Bang on a Can’s residency continues through the culminating Marathon on Saturday August 2nd; Bostonian devotees looking for a satisfying daytrip won’t regret the effort to seek such thrilling artmaking.